Aaron John Gulyas is an historian, author, educator, and sci-fi nerd. 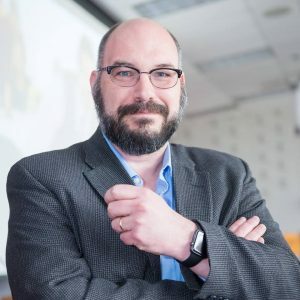 He is an associate professor of history at Mott Community College in Flint, Michigan, and also serves as a faculty technology consultant for the college’s Center for Teaching and Learning. His books include The Chaos Conundrum: Essays on UFOs, Ghosts, and other High Strangeness in our Nonrational and Atemporal World, The Paranormal and the Paranoid: Conspiratorial Science Fiction Television, Extraterrestrials and the American Zeitgeist: Alien Contact Tales Since the 1950, Conspiracy Theories: The Roots, Themes and Propagation of Paranoid Political and Cultural Narratives, and Teaching History with Newsreels and Public Service Shorts. He also hosts Saucer Life: A Podcast of FlyingSaucer History and Lore. Aaron has previously spoken in Nova Scotia at the 2016 East Coast Paraconference and the 2017 Shag Harbour UFO Festival. Loving Space Brothers and Sisters who only want what’s best for us; sinister cabals silencing virtuous truthseekers; abductions; government cover-ups; disinformation campaigns. These are just a few of the themes that have become part and parcel UFO belief since the mid twentieth century. While UFO stories often have links to the folklore of the deep past, since 1947 UFOlogy has developed its own folklore as well. Aaron Gulyas will explore some of the winding, convoluted tales that have grown or contracted, changed or stood fast, persisted or vanished. We’ll look at forces and personalities that have embellished once ignored aspects of the UFO phenomenon, factors that have relegated once prominent ideas to the furthest of fringes, and speculate about what our stories and speculation might look like in the future.